CafeSuite Knowledge Base - How to check what address and port CafeAgent tries to connect to? If CafeAgent cannot connect to CafeStation, you should verify if it connects to the correct server hostname/IP and port. 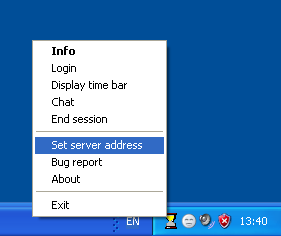 To do that use Set server address context menu item. Below's the visual guide.